Off the beaten path you will find The Holler, comprised of nearly 50 acres practically surrounded by Forest Service land with designated trails. 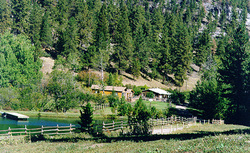 We have six trout ponds, horses, tack, etc. We also have 10 fenced pastures, each with live water and a corral, all for use by those guests who would desire to bring their own stock. Additionally, The Holler sits at an elevation of only 48-5000'. This lends to our year-round accessibility and affords our patrons the opportunity to enjoy the winter activities available such as: ice skating our ponds complete with warming hut with wood burning stove and/or fire-pits located conveniently for hot cocoa/coffee brewing and warmth, cross-country skiing, snow shoeing, or just plain relaxing. At The Holler all cabins are fully outfitted with linens, dishes, cookware, coffee, firewood, etc. You need bring only food and personal items. Come see why it's a treat to 'Hide in The Holler'. Directions: The Holler is approximately 30 miles southeast of Big Timber. Located 10 miles south of I-90, take exit #384 at Bridger Creek. Head south on the Bridger Creek Road for approximately 7 to 8 miles, continuing to West Bridger sign on right. Turn right onto West Bridger Creek. Go approximately 2 miles; stop here to check in.